New design! 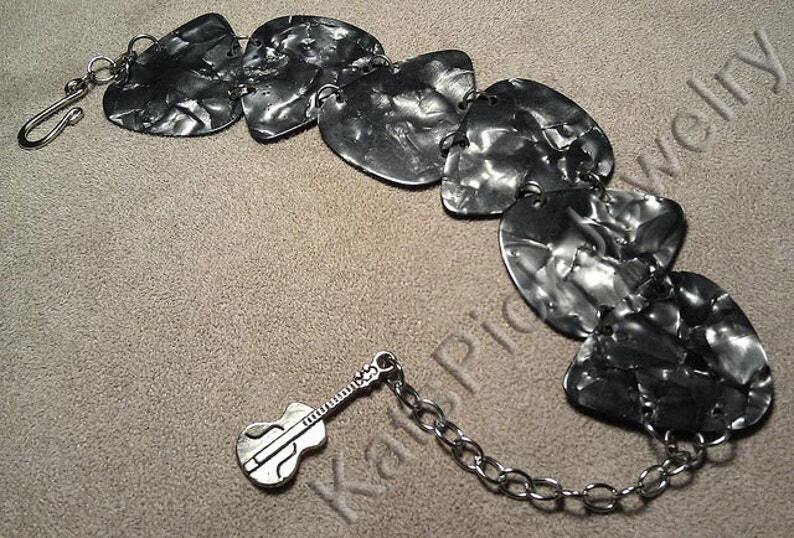 Genuine guitar picks hand crafted into a bracelet with nickel free hook closure, 2" extender chain, and guitar charm dangle. Bracelet size is adjustable from 7 - 9 inches in length. All items in my Etsy store are hand made by me. I have long had a passion for live music and have collected many guitar picks over the years. I always thought they were little pieces of art that would make great jewelry. Thus Kat's Pick Jewelry was born! I accept payments via PayPal and Etsy direct checkout. If you need to cancel an order, please let me know asap. If you are not fully satisfied with your purchase, I will refund your original purchase price once I receive the item back. I ship within 1-2 business days of receiving your order.